In just two days, the world will descend upon Helsinki. Entrepreneurs, investors, journalists, students, scientists and professionals will come together in Messukeskus, the biggest convention space in Finland, to experience the highly anticipated, full-packed days of Europe’s leading startup event. Who better to prepare us for the action than team captain, CEO Marianne Vikkula? Below, some tips on making the most of Slush 2016. In just five years, Slush went from zero to full throttle. Big name speakers, edge of seat competitions, legendary parties, massive attendance, and top-secret opening ceremonies that drum up crazy energy and set the tone for the rest of the event. So, 2016, what are you bringing? If you had to describe this year’s Slush in two words, what would they be? Can you give us a sneak peek of the opening ceremony? Mythologies and heat mixed with instrumental. We have the best speaker line up in the history of Slush and more startups than ever before. We’re also bringing the first ever direct flight from San Francisco, and starting a new industry chapter with Slush Music. What are the absolute Slush must-dos? And go to Slush Store to gear up for winter. Favorite picks from the program? Only two days left, right? After a year of hard work, Slush is just around the corner. We’re not sure who’s more excited – the attendees or the team. Proudest moment of this year’s Slush organization? Two weeks ago the crew organized Volunteers’ Day for all the 2,300 volunteers of Slush. Seeing the community come together to meet for the first time and leave their mark on Slush was amazing! When so many people come together to help out, you know you created something that has meaning. It humbles you and makes you very proud at the same time. Tips for those coming to Slush for the first time? Download the app, avoid queuing by getting your event badge from pre-Badge Claim, browse through relevant side events, and prepare by booking meetings before landing to Helsinki! The Slush 2016 team welcomes you to the North. See you soon! 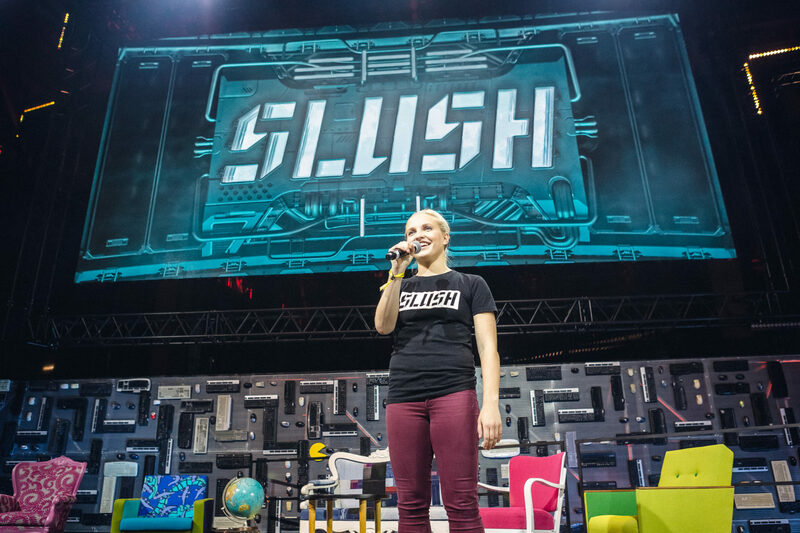 CEO Marianne Vikkula will open Slush 2016.